Militants waged 65 shelling attacks at the positions of Ukrainian military in Donbas. 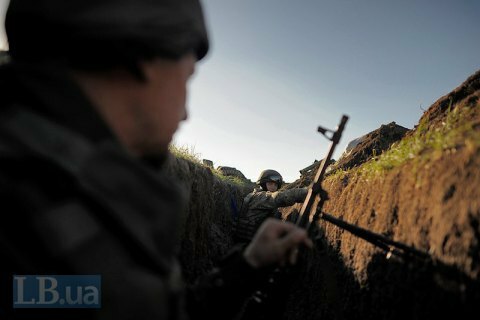 The situation in the area of the anti-terrorist operation in Donbas remains tense as militants continue to violate the ceasefire agreement. Over the past day, they made 65 shelling attacks at the positions of the ATO troops, wounding two Ukrainian soldiers. The ATO press center said in a Facebook report on 14 April that the Mariupol sector the hottest spot last day. Ukrainian trrops deployed in the area of Vodiane were pounded with 122-mm artillery systems, 120-mm mortars, armored vehicle weaponry and heavy machine guns. The defenders of Shyrokyne were shelled from 120-mm mortars, infantry fighting vehicle weapons, anti-aircraft guns, grenade launchers and small arms. Ukrainian marines in the area of Hnutove were under the fire pf 120-mm mortars and small arms. The terrorists used 82-mm mortars and anti-tank grenade launchers outside Talakivka, and fired grenade launchers at Ukrainian positions near Pavlopil, Maryinka and Krasnohorivka. Chermalyk, Hranytne and Maryinka were pounded from heavy machine guns, while Starohnativka was attacked mostly with small arms. Enemy snipers were active in the Also in the area of Vodyane, Talakivka, Pavlopil and Novotroyitske. In the Donetsk sector, militants pounded Avdiyivka from 120-mm and 82-mm mortars, grenade launchers of various systems and heavy machine guns. Luhanske was under the fire 82-mm mortars. Militants fired antitank missile system, 82-mm mortars, grenade launchers and IFV arms at the defenders of Opytne. The ATO positions near Nevelske were subjected to the fire of grenade launchers and anti-aircraft guns. Grenade launchers and heavy machine guns shelled Kamyanka and Butivka coalmine. In the Lugansk sector, fired grenade launchers of various systems at Novoaleksandrivka and Katerynivka.